The history of core training has been part of fitness scene for only about 20 years. In the past, workout routines would focus on individual body parts such as various forms of crunches for the abs and back extensions for the lower back. Exercises would be performed in the sagittal plane of motion, which would be flexion and extension of the waist area. Over time exercises in these positions started to include moving the arms and legs in various positions as well as adding resistance with weights and bands; but always keeping the spine neutral as these exercises were being performed. Fast forward 20 years, core training has evolved to include diagonal movements and most importantly side to side rotational movements (also known as movements in the transverse plane). Core training is also performed in a vertical position, which is more aligned with real life activities, instead of just training in a horizontal position. There are many advantages of having a strong core. Injury prevention, creating and maintaining good posture, improving strength and athletic performance. This is an advanced core exercise. The goal is touch the opposite shoulder with the opposite hand without rotating the lower back or hips. Other variations of anti rotation movements can be done standing up. When performing core exercises, you should not feel isolation in the low back. The entire torso should feel that it is working together and the mid-section is firm. Another highly advanced form of core training! Beginner or recovering from an injury – For someone who is a beginner or is recovering from an injury, they need to build up their core strength. Instead of trying to plank on the floor, changing the angle at which you work can be a great place to start. If your gym has a slant board this would be a perfect piece of equipment to use. Set the frame at a high angle (the more vertical your body position, the easier the exercise). 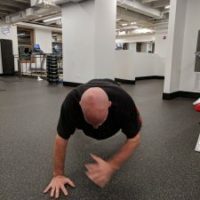 Practice planking from a higher angle, as you get stronger you can begin lowering the angle of the board until you are strong enough to perform this exercise on the floor. Before starting any fitness program you should always get a medical clearance from your doctor. Exercises like planking are technically an isometric exercise. This means your joints (elbows, knees, wrists, waist) are not moving; but isometric exercises can raise your blood pressure. because people have a tendency to hold their breath when doing isometric exercises. Unless you have a doctors clearance you should not perform isometric exercises if you have high blood pressure or are pregnant. It is very important that you focus on breathing when doing these exercises. An easy way to make sure you are not holding your breath is to say the alphabet out loud and slowly while exercising. Anyone who has a lordotic curve in their spine and has a weak core may be better off strengthening their core in a vertical position or practice their planking at a 45 degree angle using a slant board or a stable bench. To the untrained person, core training in a horizontal position may put extra stress on spine, especially if a person is overweight. The functional benefits of core training shows up when your fitness routine begins to include rotational, multidirectional and multifaceted movements. Tennis and golf players will see the advantages of rotational advance core training in their game.